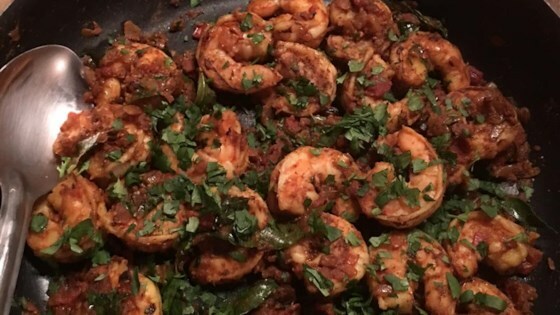 "This is a home-style South Indian shrimp curry recipe from my husband's family. It is simple and quick to make. It contains no coconut so is not sweet, just mostly juicy and as hot as you like it. Serve with basmati rice or an Indian flatbread." Season with salt and turmeric, then mix in the tomato, chile powder, shrimp and water. Reduce the heat to medium-high and cook for 7 to 8 minutes, until shrimp are opaque. Taste and adjust salt and chile powder if necessary. Season with garam masala, stir and remove from the heat. Garnish with fresh cilantro and serve with flat bread or rice. I thought it was just O.K. I did not like the combination of spices that were used. Yummy. Even my husband liked this one, and he doesn't normally like curries. SOOO good. EASY! Substituted powder curry for the leaves. Loved this! Smells and tastes wonderful with all of the spices! WOW! A little kick, but not horribly spicy!